Whispers in the bonefishing world suggested there as a killer spot to fish. I heard about bonefishing in Bonaire from my friend John Mark from Long Island. He took me out to the shallow waters of Lac Bay and we fished for hours. 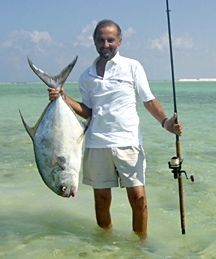 Since that day, I have welcomed several bonefisherman who have enjoyed the pristine unspoiled waters. Captain Chris from Piscatur has been taking out my clients over the years. Bonaire has managed to remain a truly special kind of secret destination. The southeast of Bonaire offers several square miles of premium bonefishing grounds with shallow, crystal clear warm water of only 3 feet maximum depth. Bonefishing here is 100% safe, no sharks, no sea urchins, no stinging jellyfish, no blister worms, no eels, nor anything else to worry about! The hard, sandy bottom affords very easy wading. Here on Bonaire, bonefishing is all wading. The average Bonefish weighs between 3 and 6 pounds, although 8- to 9-pound fish are regularly caught. The largest bonefish ever caught was over 12 pounds! Permit range between 10 to 20 pounds average, with the largest caught ever being over 30 pounds! Other fishes are also in the flats: ladyfish, gray snapper, barracuda, and several more species. To book your bonefishing adventure, contact Ann Phelan of Caribbean Wind & Sun Vacations at ann@bonairecaribbean.com. She has unique packages including rustic bungalows right on the bay teeming with bonefish to luxurious villas on the oceanfront. Enjoy the photo of a nice Permit! This entry was posted on August 1, 2013 at 11:07 am and is filed under Activities. You can follow any responses to this entry through the RSS 2.0 feed. You can leave a response, or trackback from your own site.